Dragon Pass is one of the largest independent Airport Lounge access program that provides Lounge service for frequent travelers across the globe. Their coverage is as good as Priority Pass and they also provide other airport related services like meet & greet and discounts at airport dining outlets. So, to provide access to lounges in India, they need to tie up with lounge service aggregator and that’s where DreamFolks came into picture. DreamFolks is by far the only company in India that provides single point access to domestic lounge services. In other words, we are able to access the domestic lounges via mastercard, visa, ola etc as they’re linked to dreamfolks lounge directory. Ideally, any bank/card network that needs to provide lounge service for their customers needs to go through Dreamfolks and that’s what Dragon Pass did but with a separate card for India. 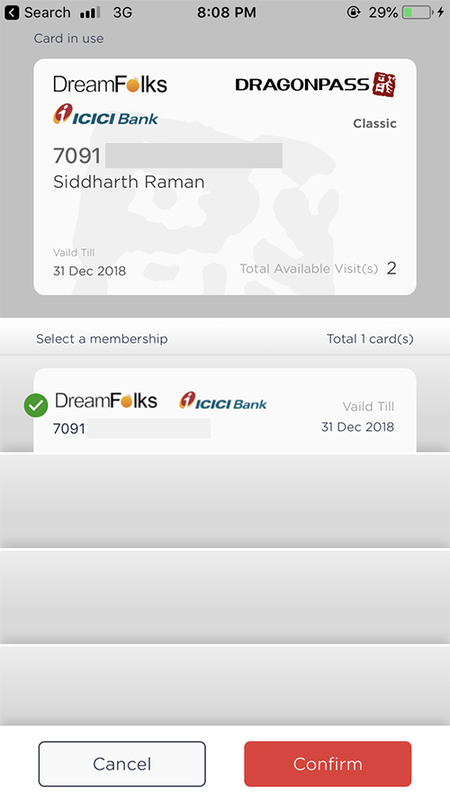 Just like Priority Pass and Dragon pass, Dreamfolks also started selling the card on their website directly, apart from partnerships with banks (like ICICI). The plans/rates are similar to Priority Pass/DragonPass. As per the changes on ICICI gemstone cards on Oct 7th, ICICI now replaced their Priority Pass benefit with Dragonpass to their Sapphiro range of cards. If you sign up for any of ICICI’s new Sapphiro range of cards, you’ll now get the Dragonpass card issued along with it. Though, for existing customers, you need to play some game to get access to it. Inspite of me having ICICI Jet Sapphiro card, i was initially denied for issuance of Dragonpass card by my ICICI Wealth Management support supervisor and was said that only “new customers” can get it. Remember, Only ICICI Jet Sapphiro variant is worth the cost, the plain Sapphiro card is not that useful. Hopefully, we may get Dragonpass cards with other banks as well in coming years. You may also get the card directly via Dreamfolks website. However, it makes sense to do this only if you go for the top end plan that costs about Rs.26k that comes with unlimited Spa access. If you’re hitting the airport very often, this is going to be a great deal. Ideally you should be making 13 trips or visit departure area 26 times a year to make use of this benefit, not that tough for busy consultants. Anyone here planning for this? 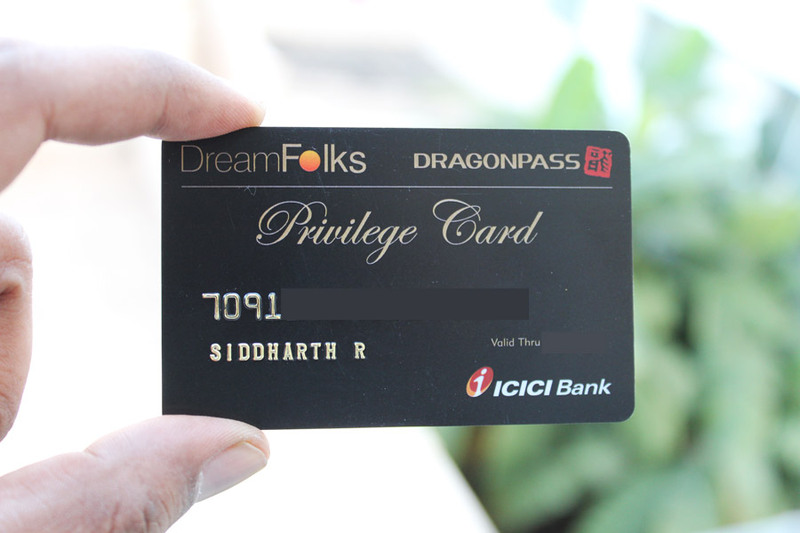 Here are the benefits of DreamFolks DragonPass Privilege Card issued by ICICI with Sapphiro range of cards. Add On: Meet & Greet, dining, etc. The limits on Spa/lounge is too low for such a premium card by ICICI. They could consider making it 4+4 atleast to make it more attractive. As i mentioned earlier, Dragon Pass (DP) lounge network is very good and is in par with Priority Pass (PP) as far as i know. Most of the lounges that accept PP also accepts DP and in addition i’ve noticed some lounges that accepts only DP. For ex, Dragon Pass allows you to access T/G lounge in Bali, Indonesia Airport while Priority Pass doesn’t. This lounge is usually reserved for business/first class for some airlines, so you get better atmosphere here as the other lounge is usually quite crowded. Remember, the Bank issued Dreamfolks Dragonpass card can be used only for access to Intl lounges. One of our reader “Siddharth Mehta” was one of the first few to access the spa benefit in Bangalore Airport and he is quite happy with the experience. I recently visited the O2 Spa at Bangalore airport and availed the spa access. Ideally you get ~30 mins session for each visits left and you can also use both visits the same day. The service is good and the receptionist is very well aware of this card. They simply take your card number and punch it in their system which shows the available visits. They deduct the count and you’re good to go. You’ll have limited options to choose, for ex: Foot spa (or) Neck/shoulder massage. You can also access the digital card of the Dreamfolks card through Dragonpass App. You need to use your card number and the password to login. You can get the password by emailing your DF card details to Dreamfolks support. India’s Credit card industry along with the Aviation sector is booming and Dreamfolks made the entry into B2C segment at right time. The Unique benefits like spa access is a brilliant idea compared to the regular Lounge access benefit. If Priority Pass follows this idea, it would be mind blowing to see how much revenues the Spa outlets would make! Its good to see a new player in the lounge access segment, after all, it should result in better card offers for consumers like us. Have you got your Dreamfolks Dragonpass Card? Feel free to share your experiences in comments below. I don’t think it’s operated the way you mention. There is no such think as Dragonpass Privilege Card that’s sold internationally, or by any other bank. Unlike a PP, you’re not really getting a regular physical Dragonpass. This thing looks like ICICI partnered with DreamFolks for domestic/spa and Dragonpass for international lounges and shoved it into one card. They can easily encode two cards onto one magnetic strip. besides, DP don’t need to partner with Dreamfolks, they are already present in India. Almost every lounge I’ve been to have a Dragonpass machine. Been in touch with Dreamfolks since then and have been waiting for months for this card to go live. I’ve just sent the article to them to check for factual inaccuracies and will update accordingly. Ofcourse its different from DragonPass Intl card. That, I can live with. 🙂 I can see use of this as they support a spa in Lucknow. Since there are no lounges in Lucknow on PP, this may help. But on 2 swipes complimentary sounds too much of a hassle to get a new card. True that. Hope they increase the free limits to make it more attractive for ppl who get the card for spa/lounge access as primary reason. I came to know that there is a lounge in lucknow which has access through diners/rupay card though have not verified the information yet !! I case , if someone has used it, do share the info. That lounge is not free for India issued cards. It is on Diners network, but for domestic lounges, HDFC uses DreamFolks, not Diners network. If you have a non-HDFC Diners card, it should be free. Otherwise, 1600 charge. Denied Lounge access in Lucknow on Rupay credit card. While most of the credit card companies have partnered with Priority Pass all kind of lounge visits in India and Abroad, I am sure with this partnership between DragonPass and DreamFolks, the footprint of Dragon Pass has increased drastically in India as DreamFolks are the biggest lounge providers in India, so I can see a lot of banks will slowly provide this option of lounge access too with their credit cards. While having a Priority Pass is good, I am sure keeping a DragonPass Card too in the pocket can sure give you access to more options when it comes to lounges. Just a small query- how do we find out whether any airport lounge has a tie up with a particular card short of walking upto it and trying our luck !! As in , say , the zesto lounge at Lucknow – which card will get a complimentary access to it ? Yes, Iconia serves the purpose for lounge access. You don’t really need to buy the packages from their website unless you need Unlimited spa benefit that comes with their top end package. I had got Priority Pass with ICICI Jet Airways Sapphiro CC. On noticing their offering change to DragonPass, I sent a mail to their customer care requesting DragonPass & without any questions, they dispatched one to my address. So, now I have their Priority Pass (which is of no use anyway) & this DragonPass. Cool. I haven’t tried the email way as i got used to instant connect to Wealth management support lately. I am holding saphiro jet airways since more then 3 years and even my spends are pretty good. But they haven’t given me priority pass with it. Are you sure they are issuing dragon pass complimentary with jet airways saphiro. Yes they do and that’s what the article is all about. Most Sapphiro card holders do not know this. You may also email them if you prefer to, worked for someone! Finally received my Dragon pass after much efforts. Though it’s valid only for international usage but it’s good to have something different from the usual priority pass. Thank you so much Sidharth for the help. Hope to provide more such useful posts and info in future. I’ve received my new ICICI Jet Sapphiro today but got no dragon pass with it. Seems like they want us to call them specially and ask for it. I called the customer care and told them that I lost the priority pass card. They said they will send the replacement priority pass card within 5 days. And as mentioned in this post, I got the dragon pass card. Btb how to activate it in the dragon pass mobile application? You can now access the digital card details via DragonPass App. I got this card delivered last week from ICICI Bank – this is replacement of Priority Pass which was issued for my Sapphiro Card. Just for this card was delivered without any specific request from my side. I just received this card after doing 2 transactions on my Jet Sapphiro card. Does the 2 international lounge access work only with international tickets or we can access them while holding a domestic ticket at any international terminal like T-3 at Delhi? Its for usage out of country. You can use the credit card for domestic access. Actually this card belongs to my dad and all his cards are having lounge access via Visa Signature only. I was wondering if there might be any case where the visa machines are not working as I’ve seen in some of your posts, then this would come as a backup option. Kolkata Airport Update (9 Jan 2018): O2 spa at kolkata airport is closed permanently, TFS lounge is open. Unable to use one of my complimentary visits to O2 spa with dragonpass card. Travelling with 6E to Delhi. Was it still mentioned on the list? If so, Raised a complaint to Dreamfolks and ICICI? Does India have a 2% cash back card on all spends? Tried using Dragonpass at O2 spa in T3 domestic terminal of Delhi. It wasn’t accepted. It is valid only for O2 spa located at international departures only. It clearly states that it can be used only at Domestic departures. Did you raise the concern with ICICI and dreamfolks? Is there a list of domestic airports when it can be used for spa? I have understood that you are holding ICICI Jet Sapphiro variant + Dragoon pass (USD 99 annual membership fee is complimentary and visit chargeable @ USD 27). Then what is the benefit, if it is not coming with the free pass with Jet Sapphiro varient. O2 spa in GVK Lounge at Mumbai T2 Domestic is in the list of spa as per ICICI Bank website. But They are not accepting it saying that they are not allowed to accept it. But they say it could be used at another outlet near to Gate no 86. There are some recent changes to the list. Usually a guy named ‘Shashank’ attends the call. He should be able to help. I used the 86 gate O2 spa yesterday. Works fine. 30 MINS foot massage was complemetary. Is this 1 per year or quarter? Siddharth : You mentioned, ”Remember, Only ICICI Jet Sapphiro variant is worth the cost, the plain Sapphiro card is not that useful”. How do you get the password for Digital Card? Is it from customer care or sending mail to which address?